Good for him, man. There are enough people on Peyton Manning's jock. Go your own way, sweaty. We all (read: I'm the only one who does this) respect you for it. Now let's pick a football game. Neither of these teams are usually impressive offensively, especially Oakland, who has only scored more than 14 points in a game thrice this season. Gimme that under. Defensively, these teams are relatively even. It's their offenses that set them apart. Kansas City is ranked seventh in DVOA on offense, thanks to their second place spot in the rushing department. Alex Smith is offering some pristine hand offs to enable that kind of success if you ask me. Oakland's offense, meanwhile, is ranked 31st in DVOA, and are dead last in yards per pass attempt. 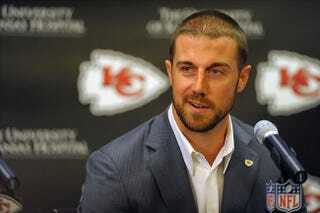 Maybe they should have signed Alex Smith instead of using whatever idiot quarterback they have now. For my pick, I'll let sweaty make this selection. Take it away, sweaty!